As I mentioned to you a few times, we are currently working on our basement. Last time I gave you an update on our basement renovation we were cleaning out the space that will be our Office and Craft Room. I had also shared with you our plan and what we will need to do in order to finish the space. I’m happy to report that the space is EMPTY! Yay! And we also got a lot of our to-do list done. Just seeing the space empty made me so happy! I knew it was going to be a nice size for our office and craft room, but seeing it empty really showed us how perfect it will be! I don’t believe I mentioned to you the ductwork situation, now did I? Well, it’s not really a situation, but more of something that I knew was going to bother me unless we fixed it. Our furnace is in the next room and all the ductwork starts in our future office/craft room. Whoever installed the ductwork years ago, had it going straight out and then gradually go up on each side. Which basically meant that the ductwork coming out of the furnace was lower and then raised. This bothered me a lot. The ductwork goes through the entrance of this room, and if we framed it as is (using the lowest part as our framing guide), we would need to stay on our left when entering the room. We also changed the two basement windows in this room. Having windows that actually open is FABULOUS! And I had no idea that windows shouldn’t allow air through if closed. haha We have VERY old crappy windows throughout the house, these are our first new windows!! Sébastien and my Dad installed the windows. 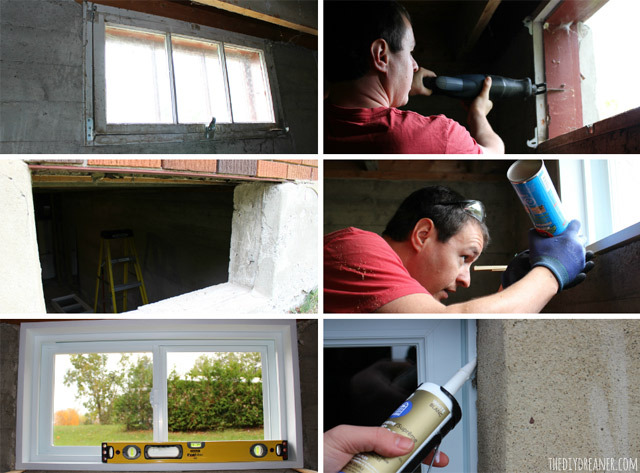 DIY basement window installation tutorial to follow soon! We also applied a waterproofing paint on the concrete walls. We don’t have any water that comes in, but thought it would be a good idea to apply something for extra protection just in case. We applied two coats of BEHR PREMIUM Basement & Masonry Waterproofer. You can get the waterproofer in various colors (very cool! ), we chose to go with white. Sébastien started applying the waterproofer with a 13 mm nap roller, but found that it didn’t apply enough paint on the concrete. He switched to a 19 mm nap roller, and it did such a better job. Seeing the entire space in white, sure made the space look like a room already! I had shared this photo on Twitter. So, what do you think of all the work we’ve done so far? 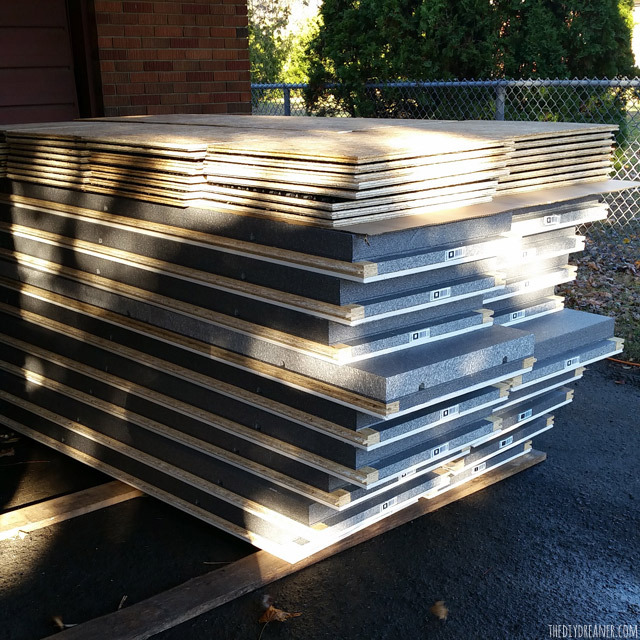 I’ll be sharing with you the installation of the DRIcore Subfloor later on this week, I can’t wait to show it to you! Disclosure: A big THANK YOU to BEHR for supplying me with paint to complete this project. As always, all opinions in this post are 100% my own. Love what you are doing! You are so lucky to have this room! 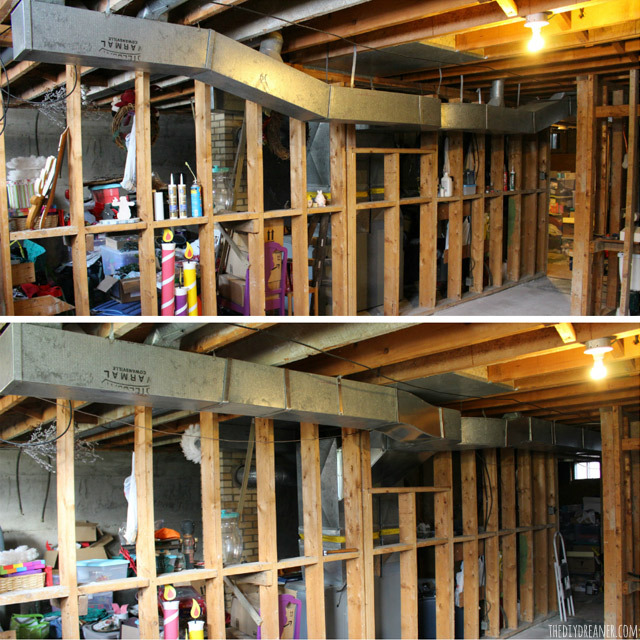 Thank you for sharing the process of your basement transition! 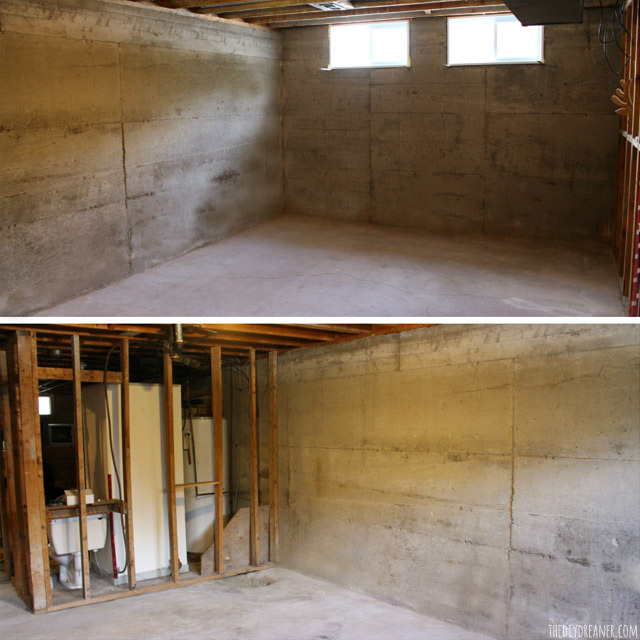 My dream is to transform our basement and I’m excited to watch your step-by-step renovation. I’m sure it will be both beautiful and functional! So exciting! Can’t wait to watch the progress! I would love a waterproof basement! Unfortunately, in our 1880’s house I don’t think that is possible without a whole lot of work…perhaps an entirely new foundation :-) For now, we like to have our little stream in the basement as long as it makes it way out via the drain hole! Christine, this is so exciting. I am also named Christine (Christines spelled without a ‘K’ unite!) and I am tackling the very same project as you. My husband and I just painted the living area portion of our basement with Behr’s Basement and Masonry paint in ‘Silver Jade’, as we don’t yet plan to add studs and drywall (our budget isn’t there yet). We are also in the middle of installing DriCore over the concrete floor. 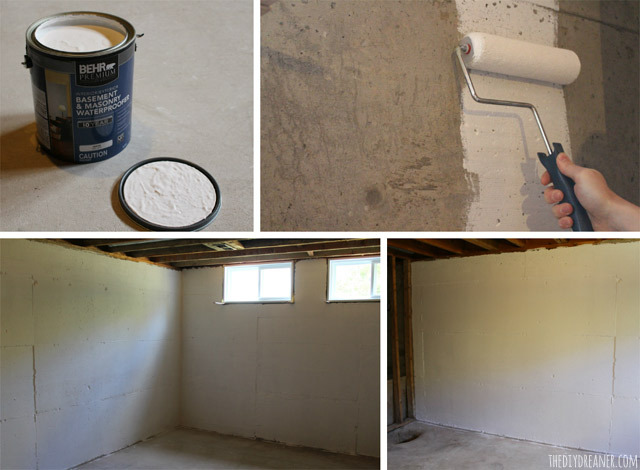 I am eager to see how your space turns out, as I hadn’t heard of the DriCore walls before – that may an option for us as well. Lastly, how are you treating your ceiling? We don’t want to drywall our ceiling, but hate the idea of a drop ceiling. Our main concern is climate control (insulation) and noise transference from one floor to the next. What ideas do you have? Lookin good so far… can’t wait to see the dri core walls goin up! Your project looks pretty good. I am excited to see how it will all turn out once you have everything set-up. I think that it is a pretty nice idea to have the work done by yourselves as it adds up to the value of the room. It does not only have a value to you functionally but sentimentally as well since it is something you worked hard for and spent time and money.